Serenity Essential Oil Blend is made with beautifully fragrant and deeply comforting oils that help the mind, body and spirit to cope with times of unusual stress and tension. This pure essential oil blend can be used in a diffuser or diluted in a carrier oil. One of our very favorites! A blend of 100% pure Essential Oils of: Clary Sage, Lavender, Marjoram, Petitgrain and Ylang Ylang. Disclaimer: The information provided here is for educational purposes only, and not intended to treat, prescribe, cure, or diagnose any disease or condition. This information is not intended as a substitute for consulting with your physician or other health care provider. Dreaming Earth Botanicals is not responsible for any adverse effects or conseque nces resulting from the use of any of the suggestions, preparations, or procedures discussed. All matters pertaining to your physical health should be supervised by a health ca re professional. Keep all aromatherapy products out of reach of children. Review: I absolutely love this blend. I diffuse it at bedtime or anytime I need to chill. I even put it in my car. People have visited my home while diffusing and asked what that wonderful fragrance was. LOVE LOVE LOVE THIS BLEND! 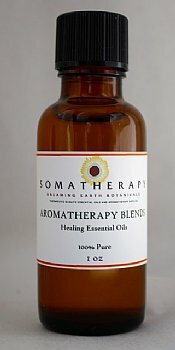 Review: This has to be, hands down, the best oil for stress on the market. And the customer service, Frank, is just a doll! So helpful and funny.